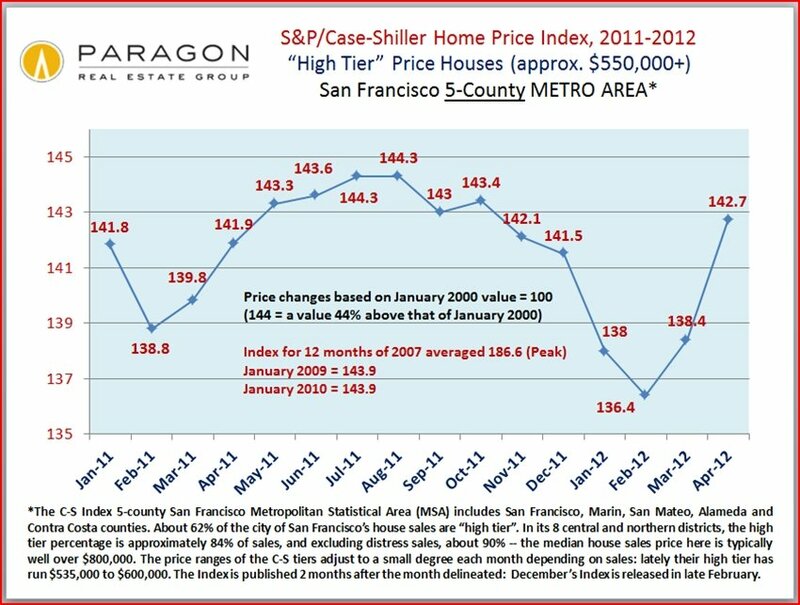 The May reading for the S&P Case-Shiller Index, released today, substantiated what we’ve known for quite some time: the SF home market (though the Index is for the 5-County Metro Area) is rapidly accelerating. Since the Index is a rolling 3-month average and published 2 months after the title month, it is always 3-4 months behind what is actually occurring in the market between buyers and sellers. Forget the world’s troubles for a little while and sit back on a comfortable sofa with your friends, family, pets, a refreshing beverage and tasty edibles and enjoy your favorite Olympic events! In July of 2010, The Wall Street Journal coined The San Francisco Marathon® “The Race Even Marathoners Fear”. Approximately 25,000 runners will flood the streets of San Francisco to take the ultimate challenge in the San Francisco Marathon, Half Marathon, and 5K events. Join the fun with your neighbors, companies, clubs, schools, teams, churches, or groups and celebrate with us! 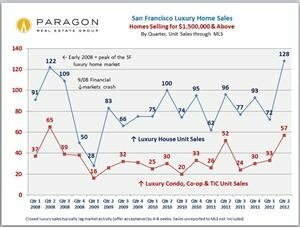 The luxury home market in San Francisco – typically defined as houses, condos, co-ops and TICs selling for $1,500,000 or more – experienced a big surge in activity in the second quarter of 2012. 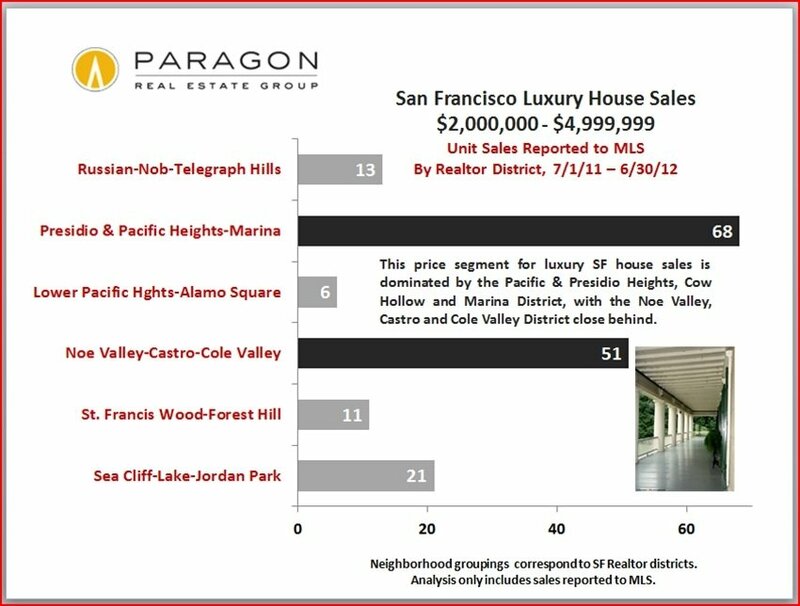 Below are a handful of charts analyzing sales by San Francisco district over the past 12 months, breaking the luxury house market in particular into three different price segments. 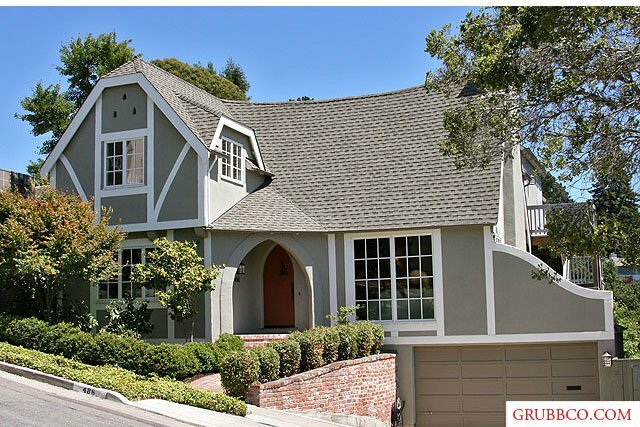 The second quarter of 2012 saw a substantial jump in the sales of expensive homes. 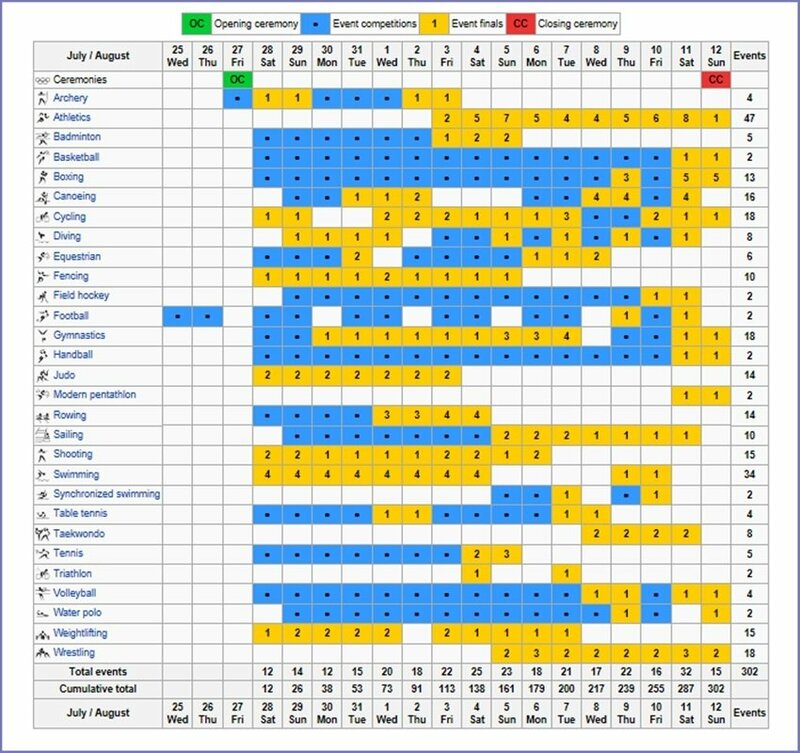 This is a sample of the many area specific analyses we perform. This chart includes a wide range of prestigious northern neighborhoods of differing values, so the numbers should be considered very general approximations. The reason why we put them all in the same basket is to get a large enough number of sales to be meaningful statistically. 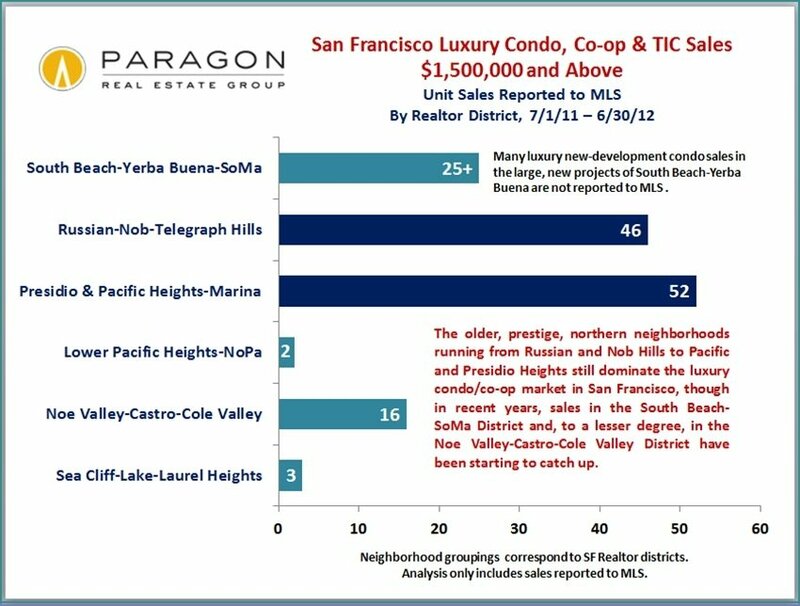 Sales not reported to MLS – such as many new-development condo sales and a fair number of high-end off-market sales – are not included in this analysis. All figures are derived from sources deemed reliable, but may contain errors and omissions, and are subject to revision. Typically, after a multi-years’ downturn such as occurred in the early eighties and the early nineties and such as we’re just coming out of now, when the market turns, appreciation goes into its own multi-year climb. 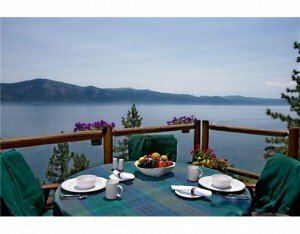 Even though the market went absolutely crazy in 1996, and despite the bubble popping in 2008, people who bought then have seen 120% appreciation in home value (much less the vastly larger return on their initial down-payment investment, not to mention the huge tax benefits — and that it was an investment that also was a home). 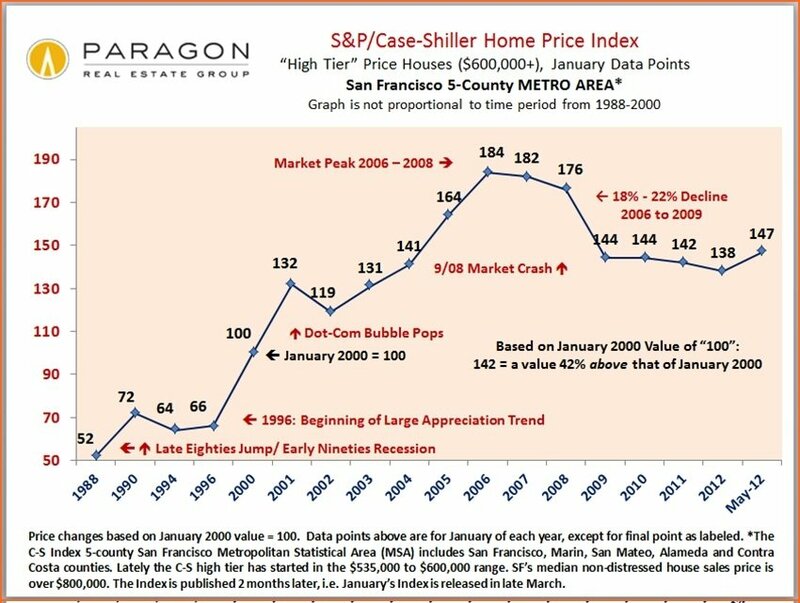 Though the absolutely best time recently to buy in San Francisco, in retrospect, was in 2010-2011, we are still just past the cusp of the bottom of the market. Historically, that is a very good time to buy. Please note that in the below Case-Shiller chart, the graph is not proportional to the time period from 1988 to 2000: those 12 years show up as much shorter than the 12 years from 2000 to 2012. If you wish, you may jump straight to the market charts. 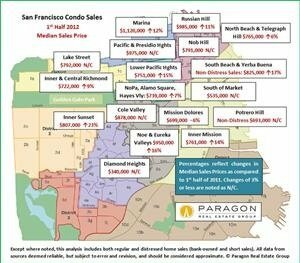 The SF real estate market is stuck. 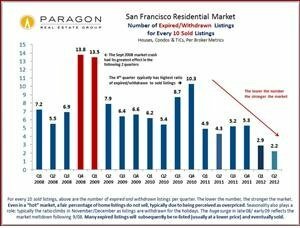 Stuck in high gear: huge buyer demand + the lowest interest rates in history + extremely low inventory of listings = (often ferocious) competitive bidding and increasing prices. 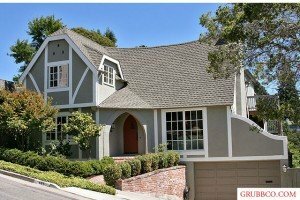 Though this trend began in the city’s more affluent areas, it has now spread to virtually every neighborhood, property type and price segment. 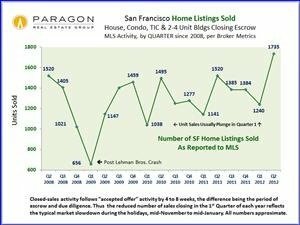 Since closed sales activity follows the time of offer acceptance by 4 to 8 weeks, the appreciation in home values has not yet shown up in the statistics for certain neighborhoods. We believe it will soon. 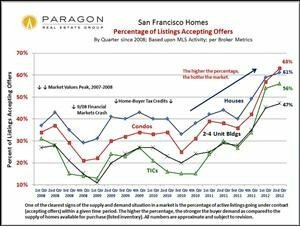 Though this situation is to the advantage of sellers (after years of market doldrums), homebuyers might take some consolation in the fact that the last time the market dramatically shifted after a similar downturn, in 1996 after the early nineties recession, there was a market frenzy much like ours today. However, people who bought at that time still ended up doing very well by getting in at the beginning of a market rebound that went on for many years, even before the housing-bubble years began. And interest rates then were close to double today’s. 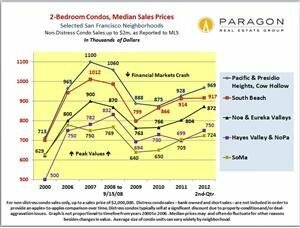 When reviewing the map analyses below, remember that median and average statistics are generalities, and how they apply to any specific property is unknown. 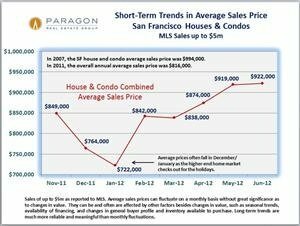 Percentage changes should be taken with a grain of salt: some neighborhoods have relatively small numbers of sales, which make statistics less reliable; in other areas, it may simply be that the size/quality mix of homes sold shifted from one period to the other — this happens. 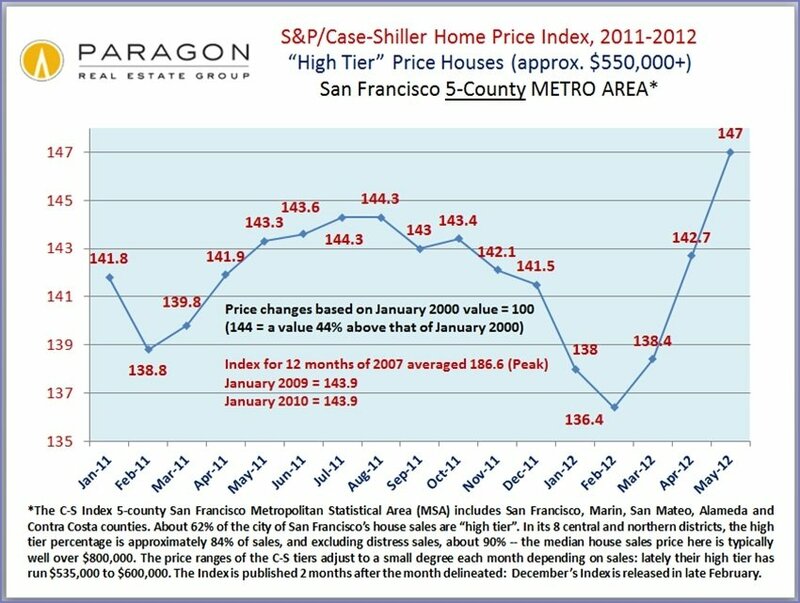 Still, overall, it is clear that the city is experiencing a general surge in home values. 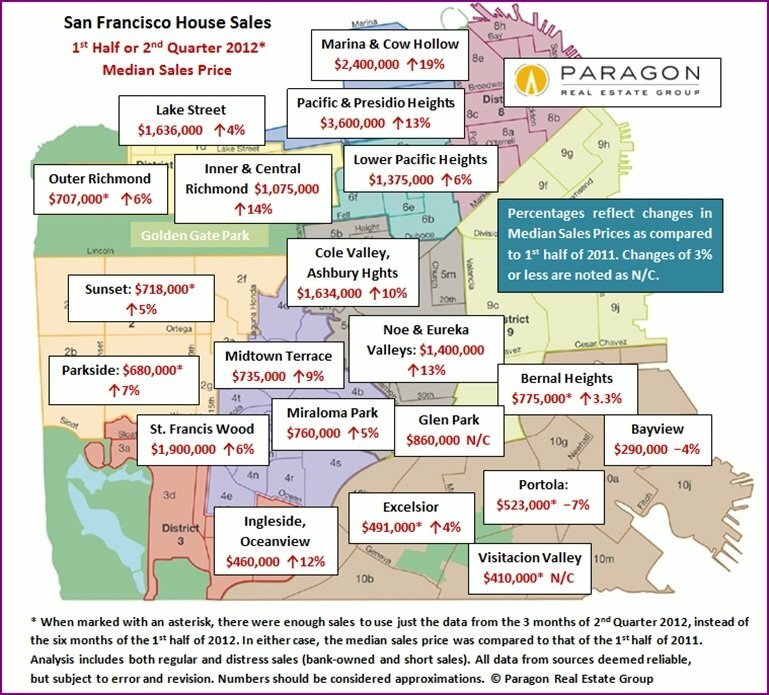 Many of the city’s neighborhoods are showing significant increases in the house median sales price, and this appears to be accelerating as we get deeper into the year. Those areas not yet showing significant change are expected to show increases in the next quarter’s statistics. 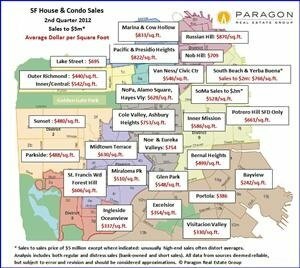 Average dollar per square foot has been increasing in 2012, and this appears to be accelerating. Two factors affect dollar volume: the number of sales and the average sales price. In 2012 both of these statistics have been jumping in the city. 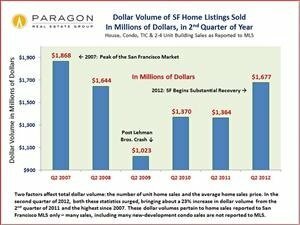 The number of sales reported to MLS has jumped to its highest number in over 4 years. 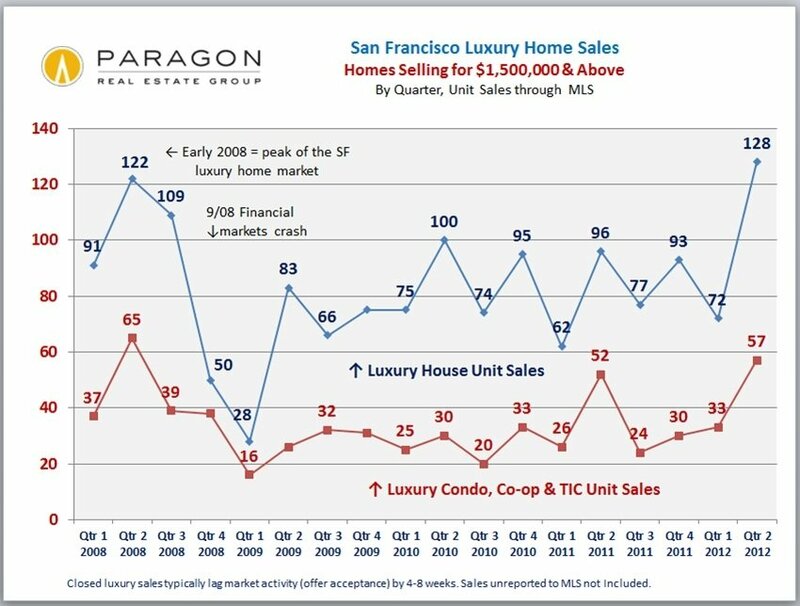 However, there are two additional factors: new-development condo sales which are often not reported to MLS are lower than in many previous years due to the crash in building after 2008 (though this is turning around too). On the other hand, it appears that the number of “off-market” sales, not listed in or reported to MLS, has surged in 2012. 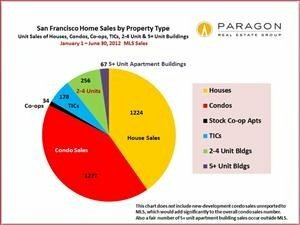 Houses and condos make up the great majority of sales in San Francisco, though TIC sales seem to be making a big recovery in the low-inventory situation the city has found itself in. 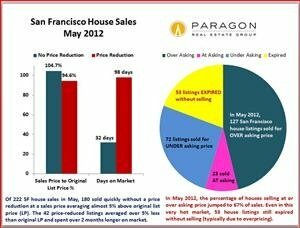 As the market has heated up, prices have risen and distressed home listings have plunged. 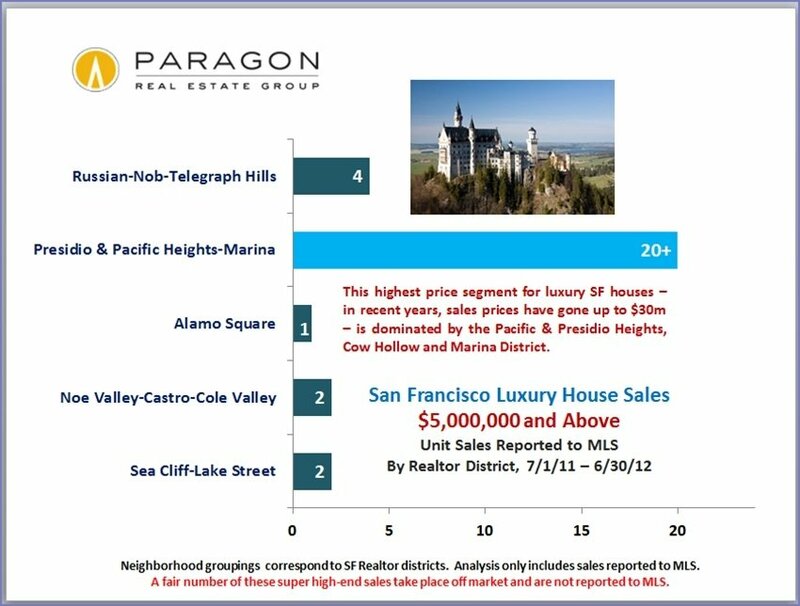 This is causing something of a shift upward in the percentage of sales in the higher price segments. 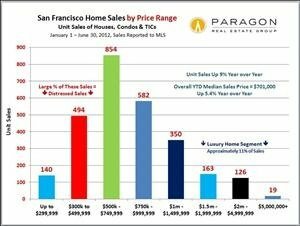 Average sales price and median sales price are different statistics, but they’re both showing the same trend in San Francisco. Houses selling without a price reduction are growing as a percentage of sales. 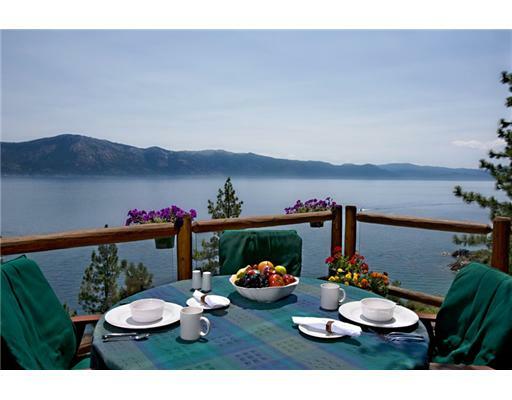 They are averaging well over the asking price and selling in the shortest time period in years. 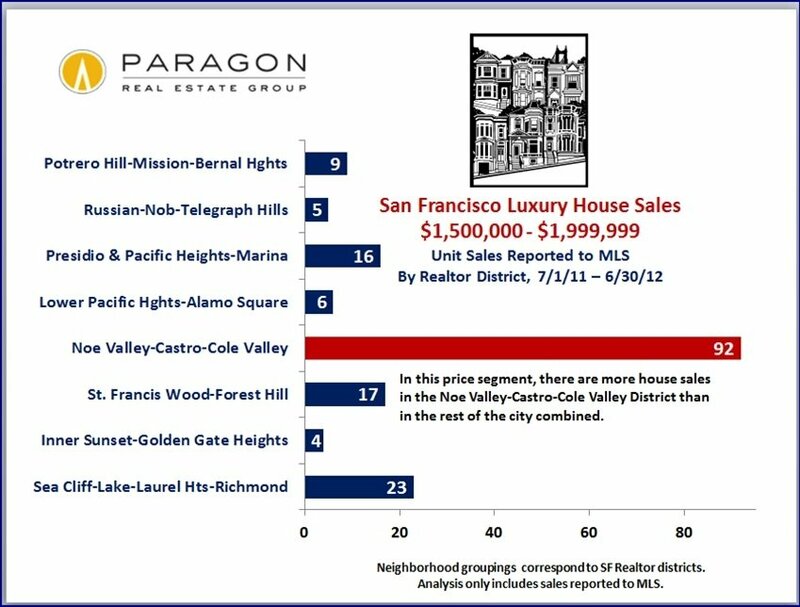 Homes selling for over $1,500,000 hit their highest level in years in the second quarter of 2012. 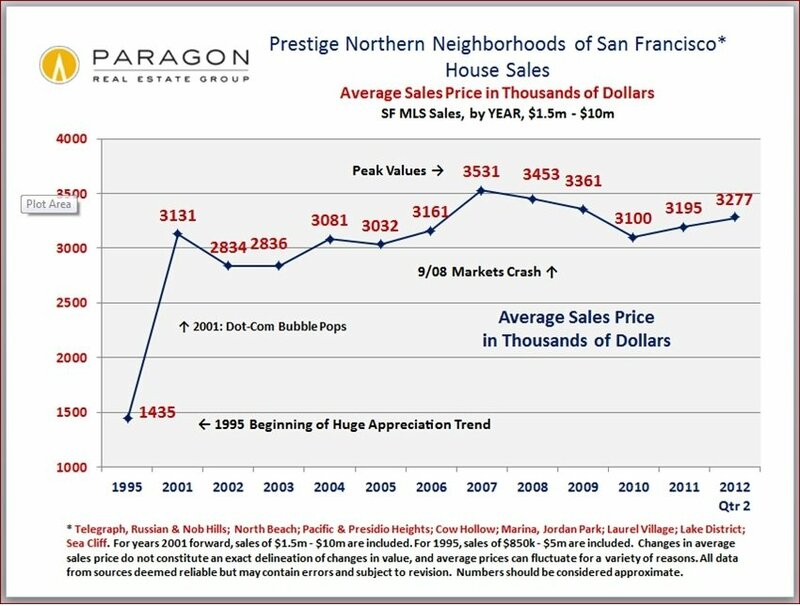 These neighborhoods have all been showing significant price appreciation since the home-price crash in 2008-2009. 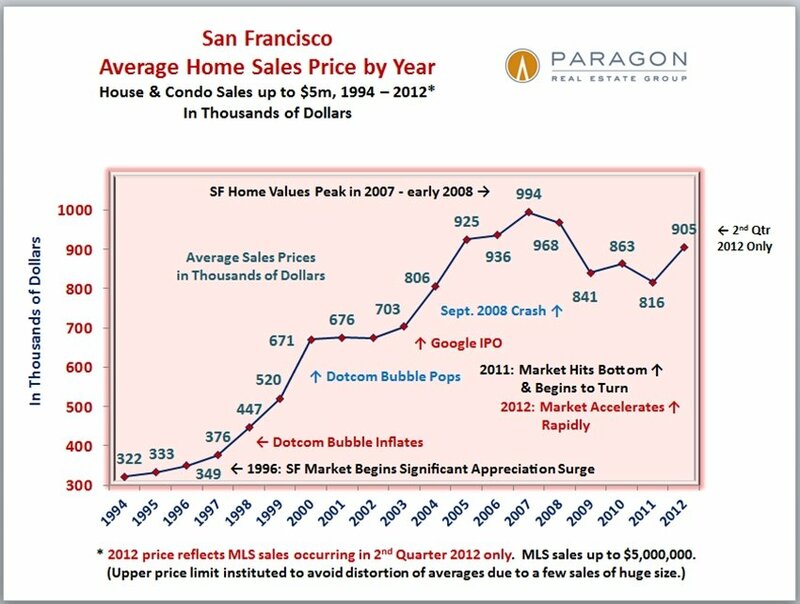 If this chart went back to 1995, it would show that median prices pretty much doubled between 1995 and 2000. As the market gets hotter, fewer listings expire without selling. Right now,the percentage of expired and withdrawn listings is incredibly low. The stronger the buyer demand and the lower the inventory, the higher the percentage of listings accepting offers. 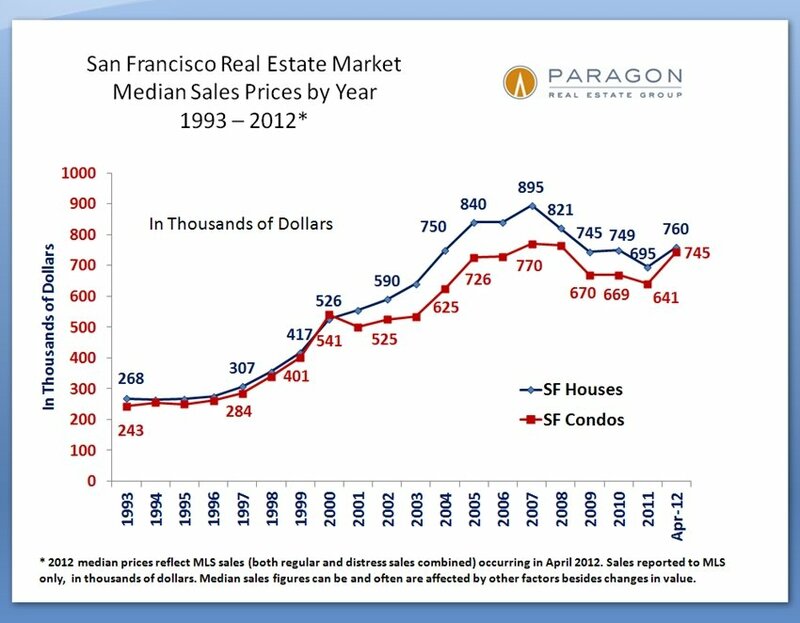 Every San Francisco property type is at its highest percentage in many years, and perhaps its highest ever.